There were two big pillars of Jewish thought. These two schools actually govern the thought of Jewish people during Jesus’ time and before Jesus’ time and one was the school of Hillel and the other was the school of Shammai. The school of Hillel, was a more open and progressive, but the school of Shammai was conservative and devoted. Both are good schools, but they’re thinking or a different. Gamaliel in today’s scripture was from the school of Hillel. Actually, as a matter of fact, his grandfather was a Hillel, so he was very much influenced by Hillel’s thought and, you know, very famous disciple of Gamaliel. And that is St. Paul that we know very well. So St. Paul was also from the school of Hillel. Gamaliel was so respected by the people during that time. And when Gamaliel passed away, the people said the spirit of the law is deceased, like deceased, like disappeared now. That was the light of the interpretation of the law is gone. That much Gamaliel was very much respected. So they gave him the name Rabban and it’s kind of glorious teacher kind of idea. As you read today’s passage, you see Gamaliel speaking on behalf of the disciples. He was very humble and open to the new ideas because they are just new ideas, let us not reject them, let us be open and see what they have to say. That was Gamaliel’s attitude and that is very much spirit of Hillel school. The Hillel School had that kind of attitude, progressive and open attitude, and what Gamaliel did was very much the spirit of Hillel. And so he said, let them be alone. A high priest and the temple police tried to kill Jesus’ disciples. But as we reflected last week, when they killed Jesus, they would not have left the disciples alone. They would have wanted to kill them movement altogether. So we see the continuation of that atmosphere, but somehow the disciples changed, but the Jewish authorities tried to kill the disciples. This is what they said when they heard this, they heard that these people were preaching Jesus, they were in enraged and wanted to kill him. I mean they thought that by killing Jesus, everything was over, but still, they were talking about Jesus continuously. So they were kind of annoyed by the disciples. So they wanted to kill them off. That’s the kind of atmosphere. But Gamaliel, who was very much respected. He stood up and he told the disciples to go outside, and there for a short time. And then he addressed the Jewish authorities. At that time it was a St. Hadrian. St. Hadrian was the most powerful kind of group, a political group or religious group. At that time politics and religion were not separate. So they made all the decision in Sanhedrin, he was very much respected. And he told he addressed the kind of parliament. He addressed the St. Hadrian. This is what he said, “fellow Israelites, consider carefully what you propose to do to these men. So in the present case, I tell you, keep away from these men and let them alone.” Just before that, he talked about Theudas and the Judas and then he said, “so in that, in this present case, I tell you, keep away from these men and let them alone. Because if this plan or this undertaking is of human origin, it will fail. But if it is of God, you will not be able to overthrow them. In that case, you may be even be found fighting against God.” I think St. Gamaliel, believed that this is a movement of human origin. That’s why he gave the example of Theudas and Judas, you know, they all had their leaders and they are 400 people followed it, but the leaders were killed and the whole movement that was killed. He gave two examples of that. And in this one too, you know, leaders died. So this movement is going to go die too. So don’t worry too much about it. Just leave them alone. Let them alone. There was Gamaliel’s attitude I believe, but without realizing it, he prophesied about the movement of the Christian movement, about Christian movement. He prophesied. He confirmed that this is God’s movement. No one could stop. He said that no one can stop this movement if it is of God’s origin. I mean, that’s not what he meant to say, but somehow without realizing it, he prophesied and he confirmed that Jesus movement and Christian movement was of God’s origin. So be careful with what you say. Sometimes it comes true without realizing. You may say it’s just anything but you may come true. I mean, he said he said this thing without really realizing it, but somehow that, that `came true and he said, if that is from God, you try to stop it, then you are against God. But the history. So there’s an irony in history, our human history is so ironical because his own disciple St. Paul tried to stop this movement. That’s why he was going to Damascus. On the road to Damascus, he met the risen Christ, but the reason he went to Damascus was to kill off this movement. To stop this movement, but on the road to Damascus, he met the risen Lord and he realized that all the things he did all along, he thought that he was working for God, but he was working against God. His own disciple, Gamaliel’s own disciple, did the thing, and then St Paul, he established a foundation of Christian thought. Jesus preached a lot, but a lot of people say that without St. Paul, there would not have been Christianity because he gave all the contents and substance of Christian beliefs about the law, about faith, about salvation, about forgiveness, everything. He just made all that and that was Gamaliel’s disciple. God used the example of Gamaliel to be the person to establish the foundation of the Christian belief system. Isn’t it amazing how God works? We don’t know how God works. I mean the disciples sitting there hearing Gamaliel, they would not have even imagined that his own disciple would be the person who established the foundation of Christian belief. They would not have even imagined it. God’s work is so awesome. Filled with awe and mysterious. It is not in our control. We don’t know exactly what the outcome will be. Once Jesus told Nicodemus that you have to be born again, and then he said that this very strange thing, this is what he said, the wind blows where he chooses and you hear the sound of it, but you do not know where it comes from or where it goes to. I mean you hear the sound of the wind, you know that there is some kind of God’s movement, but you don’t know exactly where it comes from and where it’s going to. What the result may be. You don’t know. What God does in our lives. We don’t know exactly where this takes us to. I believe that God works in your life every single person’s life, but we don’t leave exactly what that will end up with. We don’t know. It is very different from the life that we live. We live in this day and age. We live in a very well structured system and live by that tight schedule that is set for us. We feel comfortable when everything is in our control and we know exactly what the outcome will be of what we are doing. Then we feel comfortable with everything turns out exactly as I planned. Then we say that: it’s a good life. We don’t really know whether it’s a good life or not, but it just turned out to be exactly as I scheduled as I planned. Is that good life necessarily? When things go out of control is not a good life. Who are you to say that? Well, we are living. We are so comfortable with a life that is under our control. In our own grip and then that’s what we pursue continuously. That’s what I St. Paul tried to kill off this movement because they are distributing the order and also same as the Jewish authorities. Do they are? They are disturbing the order of the society they have. They have to go to keep this good structure society, but today, disciples were so different. This is what his disciples said. “As they left the council, they rejoiced that there were considered worthy to suffer this honour for the sake of the Name.” I mean disciples, I don’t think they planned to be arrested. Their plan was the experience of God’s power that he proclaimed the news and the people will receive the good news and that they will convert and all that, and then they will do God’s work, but they were arrested. That was not their plan, but that’s okay. And they were beaten up and they even said, “I’m honoured to be beaten up. I’m honoured to suffer.” I mean the way they take their life situation is so different. Nothing. Life doesn’t have to happen in the way they want it. Whatever it happens to us, they were happy. They rejoiced. They went out, they were whipped and they went out rejoicing and they kept doing what they were doing. Oh, I see very strong, confident people here. What did they have? They’re very different from people that we saw last week. They were behind the closed door. They were trembling with fear. Last week we saw that and, but today I see two people standing tall. I mean not to people, but the disciples standing tall and very confident. Why? Because they believe that God’s movement, no one can stop. What we are doing is God’s movement and no one can stop this movement, that confidence they had. Just before this passage, they were arrested. 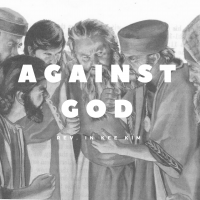 As soon as they were arrested, Peter and the disciples stood tall and they were very confident that, that this is what they said, but Peter and the apostles answered, “we must obey God rather than any human authority.” I mean they could be killed it right there, but they didn’t care. I’d rather listen to God, than the human authority, because you cannot stop God’s movement. I like that confidence. The confidence of life comes from that belief that God’s movement no one can stop. Your confidence in life doesn’t come from your ability, your intelligence, or how powerful you are, how capable you are. No, real confidence in life comes from the belief that your life is in Garson and no one can stop you from doing God’s work. There were bold. They were confident they were strong. No, there are times when things don’t work out as well. Sometimes we face problems that overwhelm us and our situations are sometimes hopeless and sometimes we feel that I cannot do any, anything further because all my strength is drained and gone. I have no power. Even a yesterday, just a whole day I was kind of looking at the weather at CP 24 and. Oh, freezing rain. Wait, when does it start? Right at 8:00. Oh Gosh, 8 o’clock? That’s when our KSM members started coming to church. I hope that you know, there are a lot of elderly people I hope that they don’t get into an accident and all that. And after it’s going to be a small service. And then I checked the email and then I found out that Josh can’t make it and okay, this is Jonathan is going to Korea. So who’s gonna lead the praise? And we asked the KSM members too. So I called Chung moksanin to discuss it, to arrange and all. Sometimes life is out of control. It doesn’t happen as we wish, but a lot of people, when that happens, that’s when they become weak and they lose confidence in life. I hope that you don’t do that. That’s when you should realize that God’s will is bigger than ours. God’s power is stronger than ours and God’s wisdom is deeper than ours. I want you to repeat after me: “God’s will is bigger than ours. God’s power is stronger than ours. God’s wisdom is deeper than ours.” When everything goes wrong, that’s what you need to believe. God’s movement you can never stop. That was what Isaiah realized. This is what he said. “For my thoughts are not your thoughts, nor are your ways my ways says the Lord, for as the heavens are higher than the earth, so are my ways higher than your ways and my thoughts than your thoughts.” That’s what Isaiah realized. What we need to do is to try our best to follow God’s will and do our best. This all we can do and we have to do. Beyond that, you cannot do anything, you try to find God’s will as much as possible and do your best. Don’t worry and don’t focus too much on the result. When you focus too much on the result, then sometimes you get influenced by human ways. You use your brain to change the course, to force the situations. Sometimes when you force the situations, it may look good for a while, but in the long run, it may lead you astray. Nothing to do with God’s will then you’ll be against God. So instead of focusing too much on the result, trying to find your gospel as much as possible and do your best. What we need is a confidence and belief that God’s will shall be done. Right after Isaiah says, God’s thoughts are higher than our thoughts and all that. This is what he says, “for as the rain and the snow come down from heaven and do not return there until they have water, the earth, making it bring forth and sprout, giving seed to the sower and bread to the eater, so shall my word be that goes out from my mouth. It shall not return to me empty, but it shall accomplish that which I purpose and succeed in the thing for which I sent it.” I mean God’s word will be done. God’s will be done. This is what God is saying. Jesus followed God’s will and that’s why he forgave people. He loved people and he taught them God’s truth, but unfortunately, people did not receive Jesus’ teaching, people did not receive Jesus’ forgiveness and love the constantly challenged Jesus and ultimately they kill Jesus on the Cross. They crucified him. In the meanwhile, Jesus could have changed his method. Okay, this doesn’t work. Let’s do this. Let’s do that as something else, maybe we do. It doesn’t matter, but Jesus didn’t do that. Jesus just carried the cross the ultimate end was carrying the cross. God brought resurrection through the cross. The most ineffective way, maybe. Maybe the stupidest thing or most foolish thing to do. That was a cross, and yet that through that cross resurrection was possible. I was thinking the disciples must’ve been really frustrated following Jesus and you always talk about love, love, love. when everybody’s hating you, everybody’s going against you. Do something different. I think the disciples could have been very frustrated. That’s why Judas betrayed him. Hey, this guy, no hope, no use. Let’s do something else. That’s why he betrayed Jesus, but Jesus kept on going. But now, the disciples realized that God’s movement cannot stop. They finally realized only through that cross, the resurrection was possible and the cross was not necessarily the foolishness. They realize. Finally, they learned, there is God’s way. We don’t know the way. You want to serve God. Serve with faith, don’t serve God with your brain. God’s work is too deep, too profound. Do you want to serve God? Serve with faith, that God’s movement cannot stop. The disciples would not have imagined while Gamaliel that his disciple who make the foundation of the Christian belief system. God is still working with within us. Live your life with confidence, live with joy. Don’t give up. Be always humble. Be always humble and live your life with faith. In the end, it will see the amazing result of your life. The process may look foolish, but the end will be in God’s hand.